1 Bullnose Texturing Tool - made of high carbon steel ground wire and a hardwood handle designed to fit the hand comfortably. The heavy duty wrapped wire is ideal for texturing encaustic paints. 1 Double End Texturing Tool - crafted with fine and medium teeth at either end for detail design work. 1 7-Tooth Scraper - allows the artist to create deep texturing cuts in small to mid-size encaustic work. 1 Medium Straight Scraper - made from stainless steel, this scraper is ideal for gently scraping layers of encaustic paint as you work to achieve a smooth, glass-like surface. Solid welded handle. 1 Medium Spatula - flexibility of this stainless steel blade allows for easy mobility of encaustic paints. 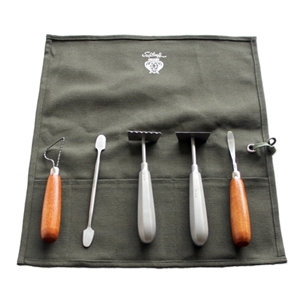 This set comes in a canvas roll for storage and ease of travel.